Articles Base reports about naked option writing. Let's be clear on this. There is no other option trading strategy that can outshine or even equal the profit generating potential of the sport of writing naked options [This attitude is SERIOUSLY warped]. The term 'sport' is used here because those who practice this money making trading technique not only turn out fabulous profits but also have fun in the process. It is a fun, profitable but dangerous option trading sport that is mostly played by seasoned and skilled option players. That is, until the sport's peril's were tamed with the use of trading techniques that, while offering substantial safeguards to the player, still continued to offer high profitability ratios, albeit at slightly reduced rates. Having made it 'investor safe' has only slightly altered the profit potential of writing nakeds and certainly, without doubt, continues to be the premiere money making trading strategy in the options market. The birth of the options market in recent decades spawned the creation of dozens of trading strategies and systems that is today being used not only by individual options traders but also by financial institutions. Stock options as an investment instrument is now widely employed as a safe and sound money strategy. The ability of options to give the investor a wide range of choices in stock market investment is what has made the options market grow by leaps and bounds over the last two or three decades. There are dozens of option trading systems being employed by individual investors as well as financial institutions. Each system is designed to accomplish a specific investment goal. A financial institution may use long put options to hedge its winnings in stocks that have appreciated in value, another investor may buy call options instead of stocks to enter a position in a security that has caught his fancy. Still another may sell calls against his stock holdings to generate income from his stock position, or what is now popularly known as covered call writing. Trading strategies, techniques and systems available to the option trader are so numerous today that it would take a whole book to describe each and that would be just a brief description not a detailed explanation. It would be far beyond the scope of what we could cover in this short article. Most of the strategies are based on the principle of buying calls and puts or, variations of this strategy such as the use of spreads. The reason for the popularity of buying calls and puts and its variations is quite simple [Agreed]; limited or defined loss against the potential for [illusion of] unlimited and fabulous profits [The profitability of options limited by the solvency of the sellers.]. This is what has driven thousands into the options trading game. But like everything else in life there is always a trade off. While the potential for fabulous profits against limited investment exists the reality of achieving such success is restricted. It's almost like buying a lottery ticket with the potential for winning fabulous riches. Or putting it differently, it's also akin to going to a casino and placing bets on gaming tables with the hope that at the end of the evening you will come out with more money than you came in. As we all know there are very few winners in casinos and that is why the gaming business offers tremendous profits for the operators. But one can be an option trader and be in a similar position as the casino operator. How? By being an option writer or seller instead of a buyer. For every option that is bought in the market, there must be a seller or writer of the option. These writers are the casinos in the options business. As the option seller you take the bets from the option buyers and since 75 to 80 percent of all options in the market expire worthless, you the seller pocket the premiums paid by the buyers when the options they bought expire worthless. For the benefit of those who are not familiar with gambling casinos, the winning odds of casinos over the betting player is only around 5 percent and yet they rake in profits from this business. Now imagine this, research and studies have shown that the option writer (seller) has better than 10 to 20 percent odds over the option buyer. Option traders who successfully use the strategy of selling options consider themselves as having found the Holy Grail of Investments. And of all the variations in option selling strategies (just as many as there are in option buying), writing naked options is considered to be the Cadillac division. No other option selling system offers the profit potential of the naked writer. 2) For many, options trading has become synonymous with making big profits quickly from small investments. Option sellers on the other hand, do not have the potential for outrageous profits from any single trade, and by not being a get-rich-quick proposition it is less popular to traders who are looking for big returns on their small investments. It must be noted however, that option writing is fast gaining popularity among serious investors looking to grow their wealth at a steady, consistent and secure manner regardless of market or economic conditions. For those willing to venture into this lucrative field for long term capital appreciation don't let the first reason above frighten you into inaction [currency collapse drives prices of everything up to infinity. Anyone writing naked call options faces the prospect of unlimited losses. Be scared]. There are many ways one can protect himself and conquer the element of 'unlimited loss' in writing nakeds [and subprime mortgages can be repackaged into 'AAA' securities (sarcasm)]. The author of this article is one of many successful naked option sellers. He has put out an e-book detailing a trading system that uses a three pronged strategy that trounces the so-called risk of loss to be almost negligible. Information about his system can be found at his web site. CoyotePrime reports that Derivatives Decline to ONLY $592 Trillion. The Economy: "Derivatives Decline to ONLY $592 Trillion"
"The derivatives market shrank for the first time in the second half of 2008 as the global financial crisis curbed trading, the Bank for International Settlements said in a report. The amount of outstanding contracts linked to bonds, currencies, commodities, stocks and interest rates fell 13.4 percent to $592 trillion, the Basel, Switzerland-based bank said yesterday. That's the first decline in 10 years of compiling the data. The amount of credit-default swaps protecting investors against losses on bonds and loans fell 27 percent to cover a notional $41.9 trillion of debt. The data compiled by the BIS, which was formed in 1930 to monitor financial markets and regulate banks, are based on contracts traded outside of exchanges in the over-the-counter market. Interest-rate derivatives remained the largest part of the market, falling 8.6 percent in the second half of 2008 to $418.7 trillion outstanding, the report said. Foreign exchange contracts fell by 20 percent to $49.8 trillion. 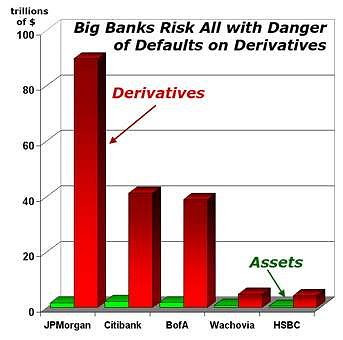 The amount of equity derivatives declined 36 percent to $6.5 trillion and those linked to commodities contracted by 67 percent to $4.4 trillion [Because the price of oil and other commodities tumbled]. Derivatives are financial instruments derived from stocks, bonds, loans, currencies and commodities, or linked to specific events like changes in interest rates or the weather. Credit-default swaps pay the buyer face value in exchange for the underlying securities or the cash equivalent should a company fail to adhere to its debt agreements." American Futures explains option margin. Margin: The sum of money or securities, which must be deposited - and maintained - in order to provide to both parties a trade. The exchange establishes minimum performance margin accounts. Brokerage firms often require performance margin deposits that exceed ex-change minimums. In turn, they post and maintain customer performance margins with the Clearing Corporation. Option sellers can post Treasury Bonds or other approved collateral to satisfy initial performance margin requirements. Buyers of options do not have to post performance margins since their risk is limited to the option premium. My reaction: Option writing can be described in the same way as security lending, "make a little, make a little, lose a lot." 1) Option writers misunderstood the risks involved in their activities. In the last few years, in an environment where investors are chasing yield, collecting the premium income from writing options became a way of sustaining returns while hoping that nothing too bad happenned. The first article demonstrates this warped attitude ("the Cadillac of All Option Trading Strategies"). 2) Naked option writing creates demand for debt. As American Futures explains above, option sellers must post treasury bonds or other dollar denominated debt as collateral to satisfy margin requirements. So the $6.5 trillion equity derivative market translates into demand for 2 to 3 trillion treasuries and other 'high quality' debt. If the equity derivative market shrinks, these treasuries will be sold. A) The value of collateral backing option contracts will fall with the dollar. B) Wall Street broker-dealers will go bankrupt. 4) Options have enormous potential for abuse, especially insider trading. For example, the SEC made several suspiciously timed decisions last year which prompted me to email my elected representative. SEC Chairman Christopher Cox has rewritten the rules of t he free market THREE TIMES this year, and each time has caused over 1000 point swings in the Dow. First he ban short selling on 19 financial institutions, then he removed that ban. Finally, he has now banned all short selling. Stock prices should be determined by market forces and not the whims of SEC Chairman Christopher Cox. SEC Chairman Christopher Cox didn't hurt hedge funds. They got advance warning and profited handsomely. The ones Christopher Cox were regular investors who believed in America's free market and who didn't know this was coming. In other words, every time the SEC changes the rules of the game it hurts the regular investors, the ones it is supposed to protect, and rewards well connected hedge funds that have advance warning. IF THE SEC IS GOING TO COMPLETELY REWRITE THE RULES OF THE FREE MARKET ONE DAY BEFORE OPTION EXPIRATION, THEN IT SHOULD CANCEL ALL OPTIONS FOR THAT EXPIRATION DATE. BETTER YET, THE SEC SHOULD WAIT UNTIL AFTER OPTION EXPIRATION OR NOT CHANGE THE RULES OF THE GAME. Conclusion: Buying/selling options on the verge of a currency collapse is insane. Even should you make the correct bet (ie: buy call options on a gold mining stock) odds are a default will wipe out your profit. nice article. Based on the same assumption (currency risk) I own some $90/Barrel calls on oil. Whatever happens... economy o.k. = oil up, or debased dollar, I will profit. The case of the issuer (big bank) collapse is hedged by PM, as that would result in a huge crash of the banking/monetary system. again very nice article, thank you for explaining your insights so clearly for the public.